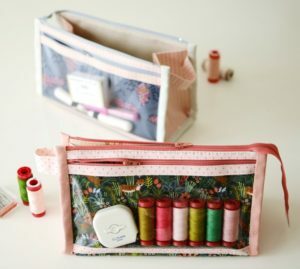 I have two overlockers and so if you don’t have an overlocker and would like to use mine to see if you like them, then that is possible – just let me know at the time of booking. Taking simple designs and scraps of fabric this class will teach you how to create wonderful decorative pieces using a very free and simple technique. Using a selection of my own templates, we will use marking tools to transfer the designs to the fabric and you will learn how to use your sewing machine in a more versatile manner to create bespoke small panels that could be made into bunting, bags, pouches, small quilts and many items of homeware. You will have the use of my oodles of scraps a well as wadding and other stabilisers for you to try out this fun technique. Saturday 3rd August – I will be teaching this class at NEC for the Festival of Quilts – bookings via the FOQ website. All classes come with cakes and laughter … Have a go .. once you have learned the basics you won’t look back. If this is your first patchwork class then you will be given a fabulous 150+page book to support your continued learning. 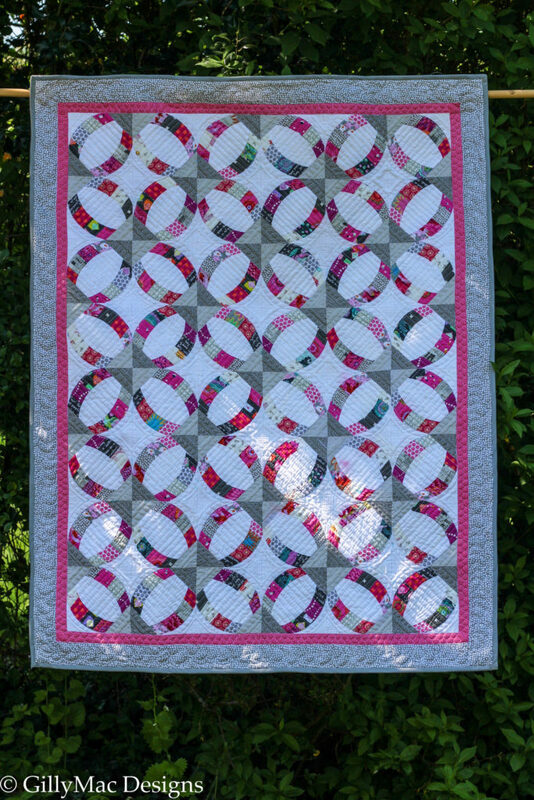 You can make this scrap or jelly-roll-friendly quilt as either a lap/baby quilt 33″x44″ or a single sized quilt 57″x76″. 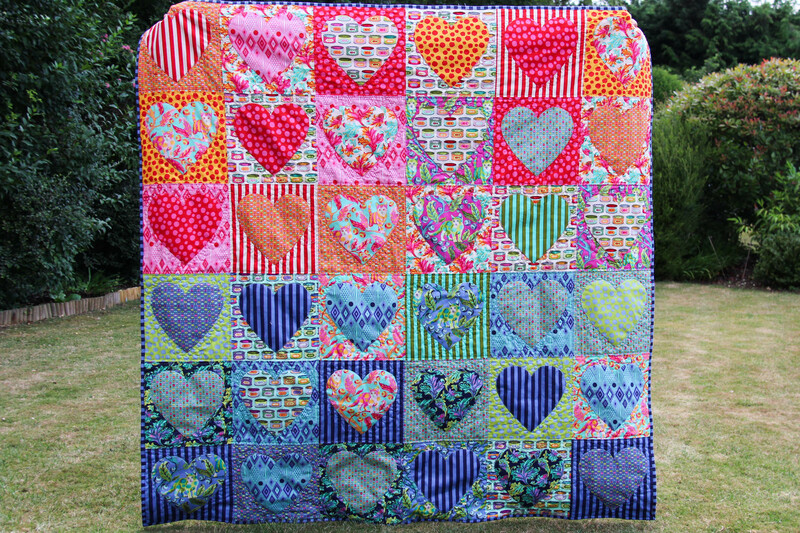 You will use either the Sew Kind of Wonderful Quick Curve Ruler or the Mini Quick Curve Ruler to create this smashing quilt. Cutting out is made very easy using the guide slot in the ruler to cut out the pieces. If you have never pieced curves – don’t be concerned, as this is easy and there is no need for excessive pinning, a few tips and you will have it nailed. 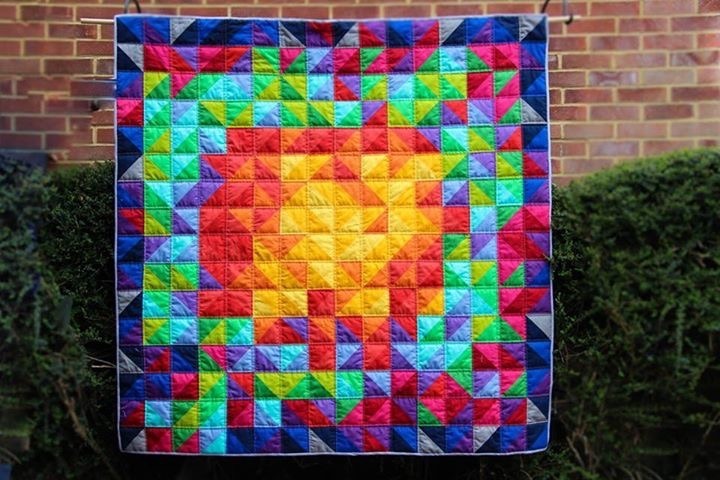 I have no doubt you will love piecing this quilt – and for afterwards, I will also give you my own quilting plans for you to use should you wish to. Drop in classes will be available for finishing off support if you need it. Rulers will be available to borrow after the class to complete the cutting out if needed. 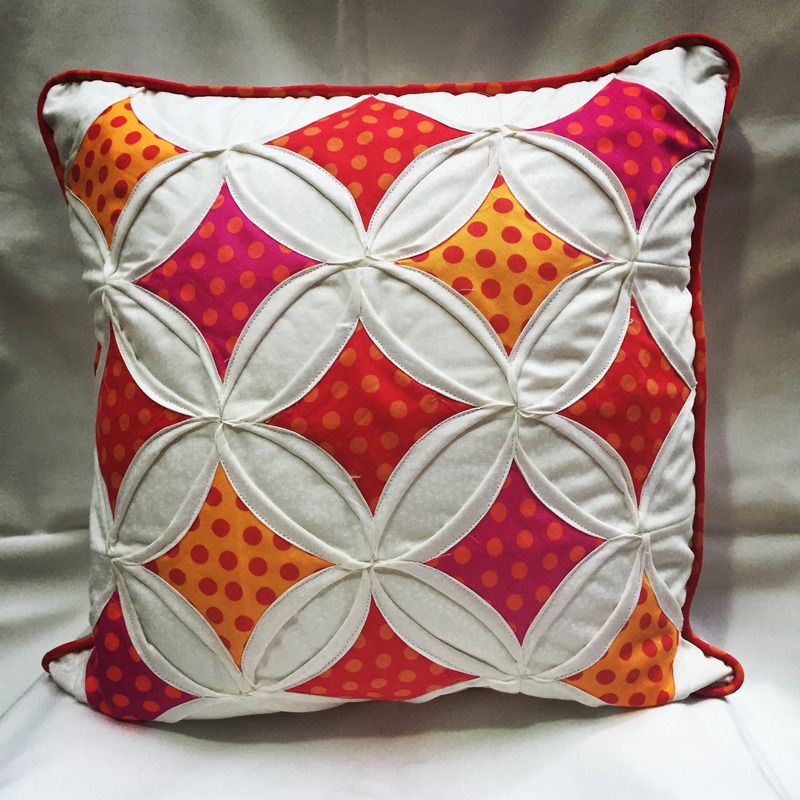 This fabulous cushion is made over two evenings. 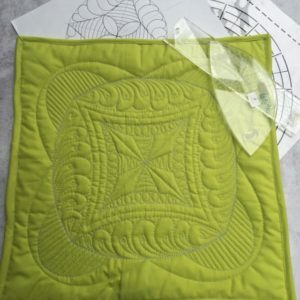 It looks much more complicated than it is and with some clear tuition, you will love how quickly this cushion comes together. In the picture, I have multicoloured windows, and a white background and window edges, but you could easily have a dark background and even multicolored window edges !! 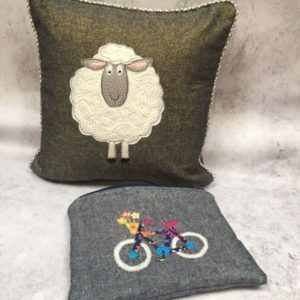 You will leave the class with full cushion making instruction and have the opportunity to make piping and prepare your cushion back with a zip. 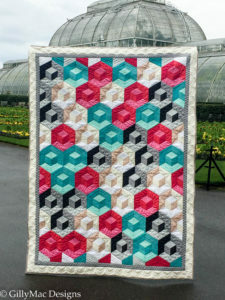 how to apply these designs to real patchwork spaces and borders that aren’t going to fit a complete number of repeats of patterns. 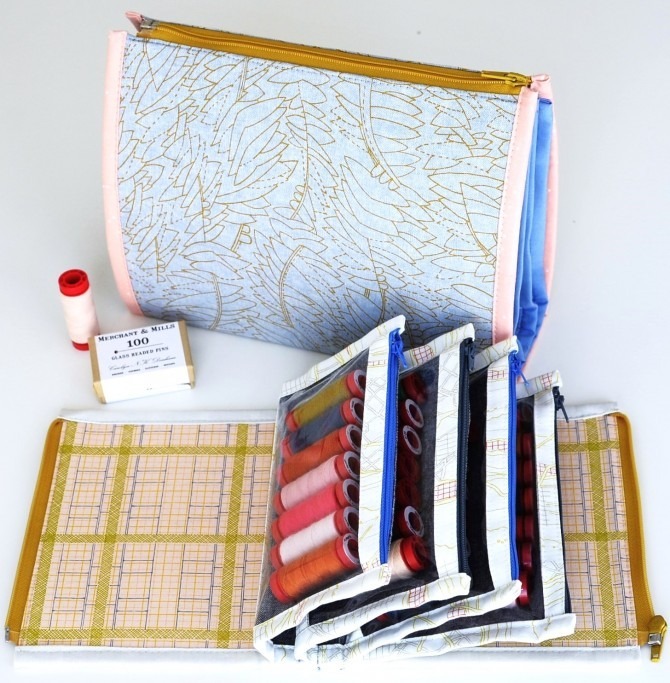 To facilitate this class, I have 4 domestic machines and one sit down long arm machine set up for ruler quilting, each with a complete set Angela Walters of rulers. Should you wish to use your own machine, I can help you ahead of time purchase a foot to use on the day. 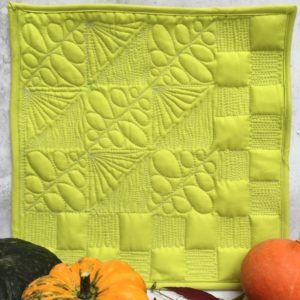 Recommendation: It is very useful to also take the Quilt-As-You-Go Class to learn how to combine your beautifully ruler quilted small pieces into a much larger quilt. Become comfortable using various marking tools to create a framework for your designs. 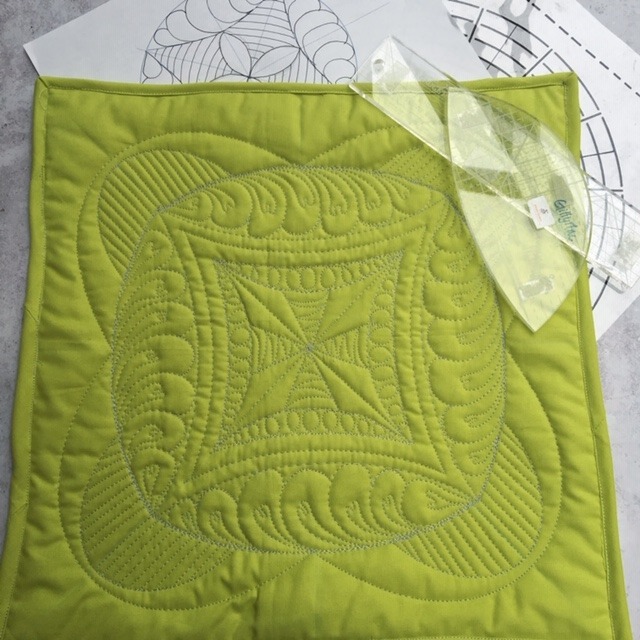 practising easy fillers for within your ruler work – if you have already completed my doodle quilting class, this is a perfect time for you to practise the doodles! 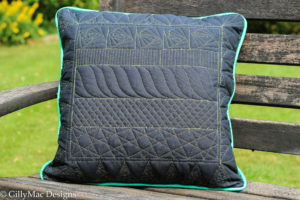 Any of the pieces you create on the day can be joined to make a small lap quilt or used individually as cushion covers. 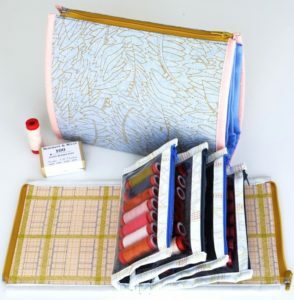 As with the ‘Introduction Class’, I have 4 domestic machines and one sit down long arm machine set up for ruler quilting, each with a complete set Angela Walters of rulers. Should you wish to use your own machine, I can help you ahead of time purchase a ruler foot to use on the day. 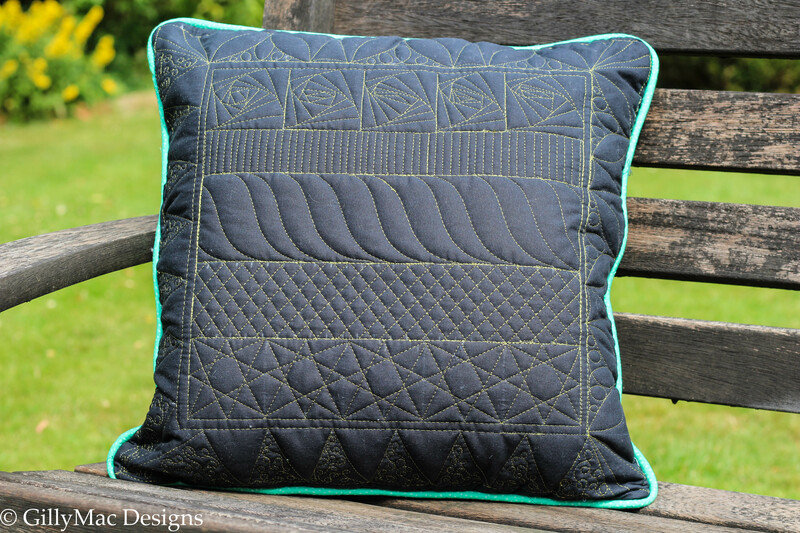 Recommendation: It is very useful to also take the Quilt-As-You-Go Class to learn how to combine your beautifully ruler quilted small pieces into a much larger quilt. Quilt-As-You-Go is an ideal way to quilt smaller pieces and join them AFTER the quilting is done. Many modern machines have a small ‘throat’ and so manipulating larger projects through this space can be troublesome. 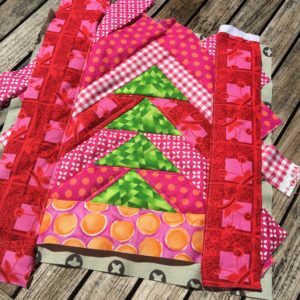 In this class, we will make up a number of fun wonky log cabin and geese blocks by preparing them with wadding and backing already incorporated. 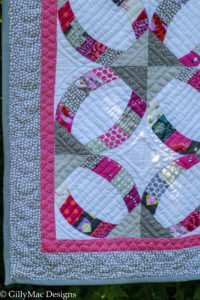 In this way, once we have pieced them, they are already quilted and ready to join together. We will then investigate and practise three different methods of joining the quilted pieces together. We will finish by looking at techniques for reducing bulk and adding borders and binding. This much-loved GillyMac original quilt in our house and stays happily in my daughter’s arms even on sleepovers. The design simply uses 1/2 square triangles – a technique you will be taught on the day if you are not familiar with it. Unlike similar patterns on the market, this one is designed to get the maximum colour punch with a minimum amount of fabric waste. 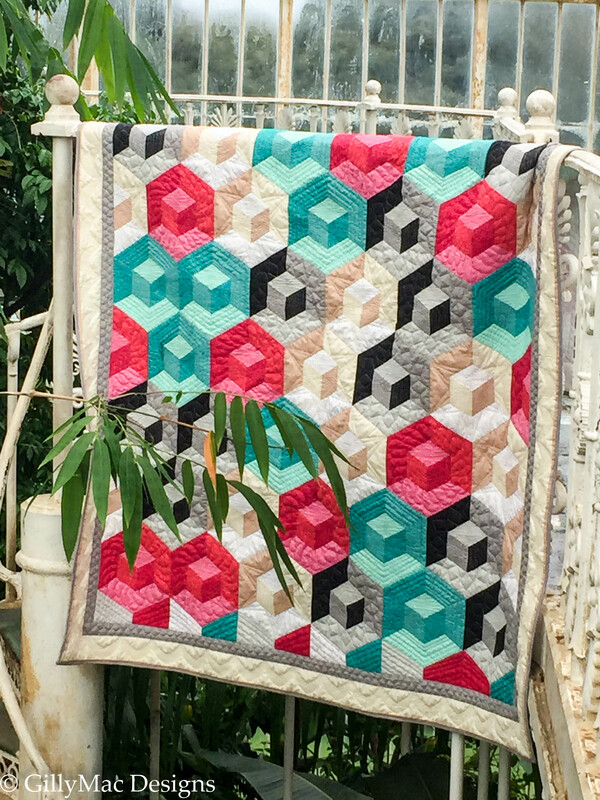 This quilt can be resized, by making the base squares small or using only part of the design if a small quilt is desired. I’d be happy to help you with this adjustment. This is a fabulous make that is very achievable in a single day/evening by all skill levels. 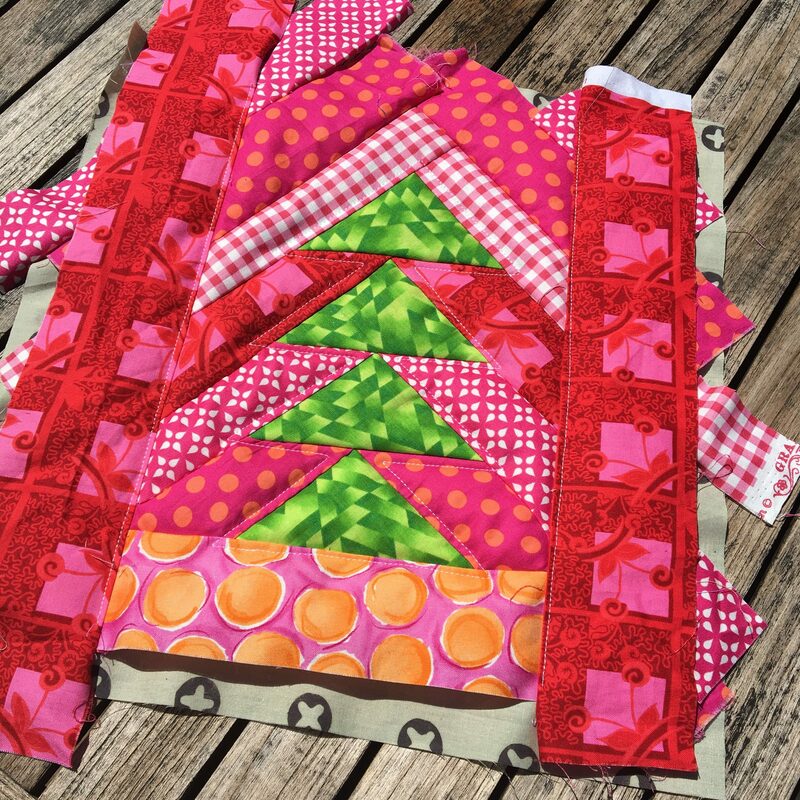 I love Aneela’s patterns as they are ALWAYS successful and make me look much cleverer than I really am 🙂 For this class I will supply the interfacing and cakes, you supply the fabric and good cheer and together will make an AWESOME 3-in-1 Pouch. 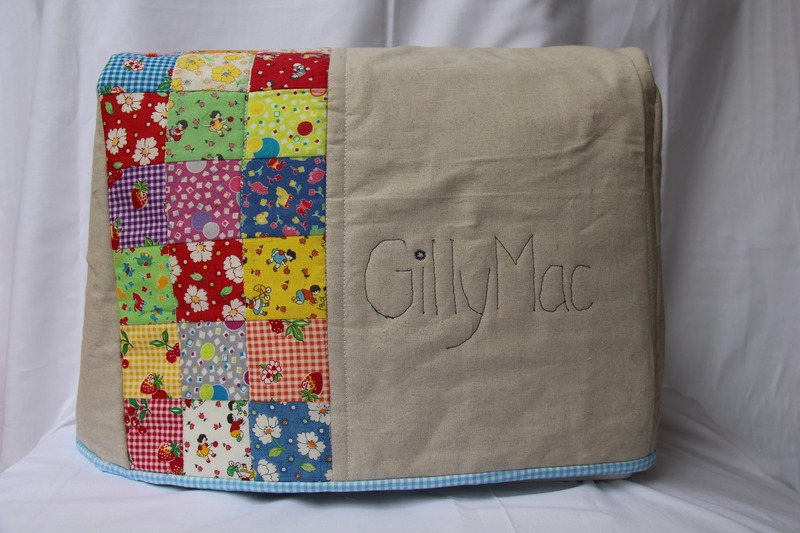 Bring along your sewing machine or overlocker and I will teach you how to make a bespoke cover for it. Dust in your machine can disturb the easy running of the thread and mechanisms. The plastic cases or covers that are supplied by the manufacturer are not very attractive so why not come along and create something special for your own machine. This original GillyMac pattern will look amazing with whichever pallet you choose. 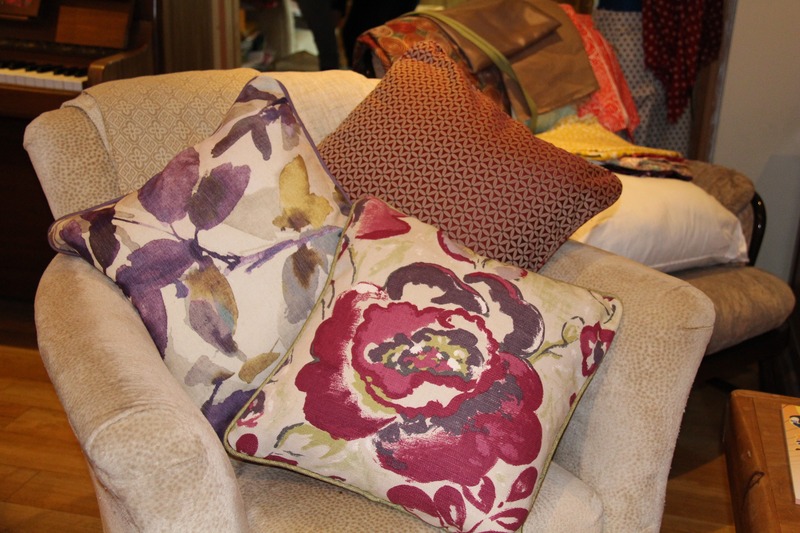 Why not change out some of the plain fabric for patterned fabric to create a very different look. 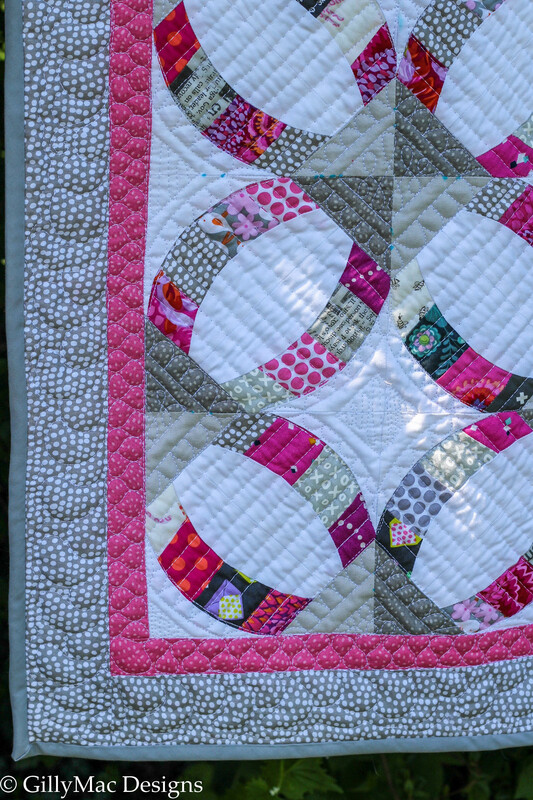 This quilt comes together quickly and each pattern comes with a bonus quilting plan. 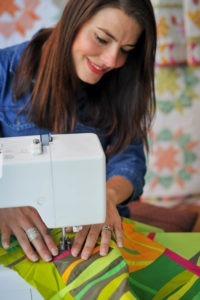 There are no scary Y seams and you will have people guess as to how you made it! 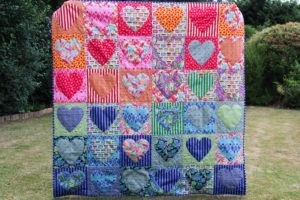 The quilt comes in lap/baby, single and twin sizes. 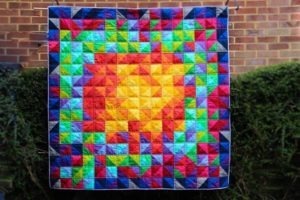 This quilt is not difficult and is beginner friendly. 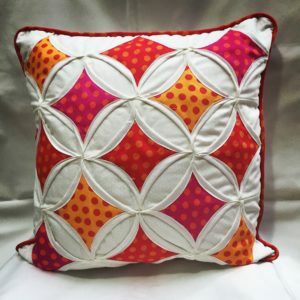 Good quality cushions can be really expensive to buy but are super easy to make. 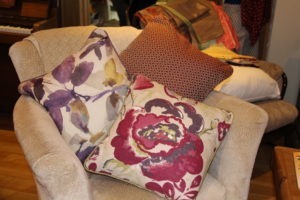 In this class you will come with fabric and a cushion pad and walk out with a wonderful cushion – with a zip and piping . Creating your own piping makes for a really professional look and once you know how to make it, you will be able to make piping for any project and turn that item from having home-make look into having a professional finish. This class is suitable for beginners. 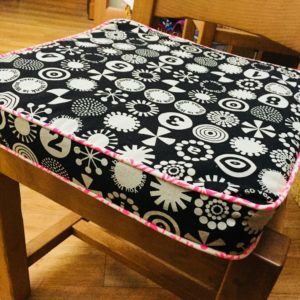 Come and make a Boxed Cushion – maybe for the blanket box you have been meaning to sort out for ages, or the garden seats or maybe the boot of the car for the dog! 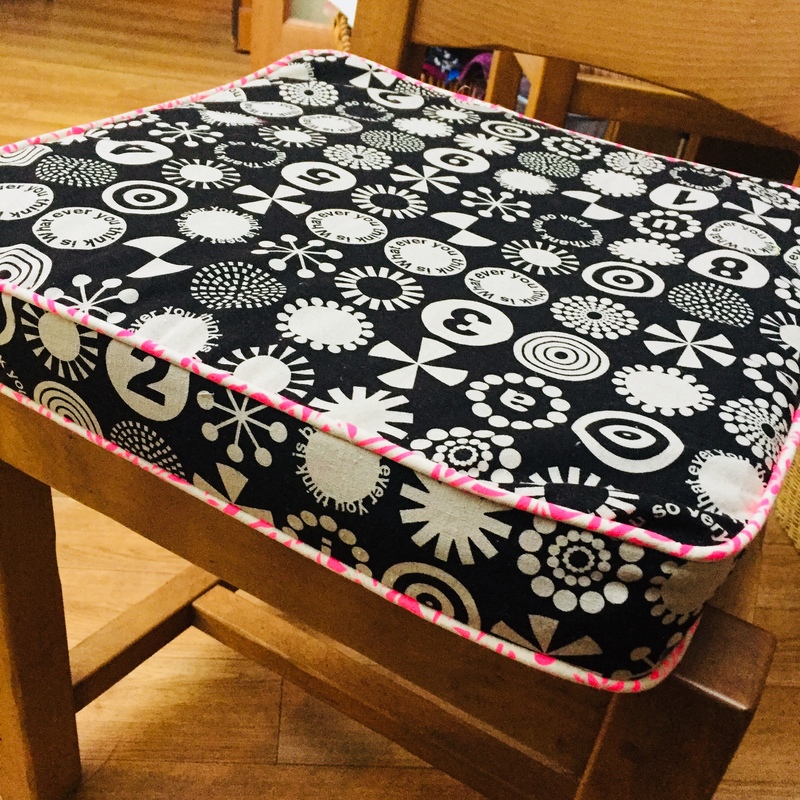 Whatever the case, a small boxed cushion can be made in an evening and once you understand my method you will be able to go on and create a set or scale it up for the garden bench! Join me for four weeks of dressmaking. 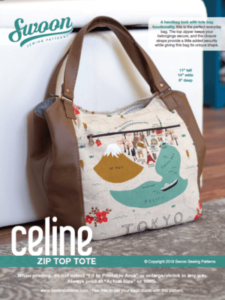 Bring along a dressmaking pattern for yourself or someone else. 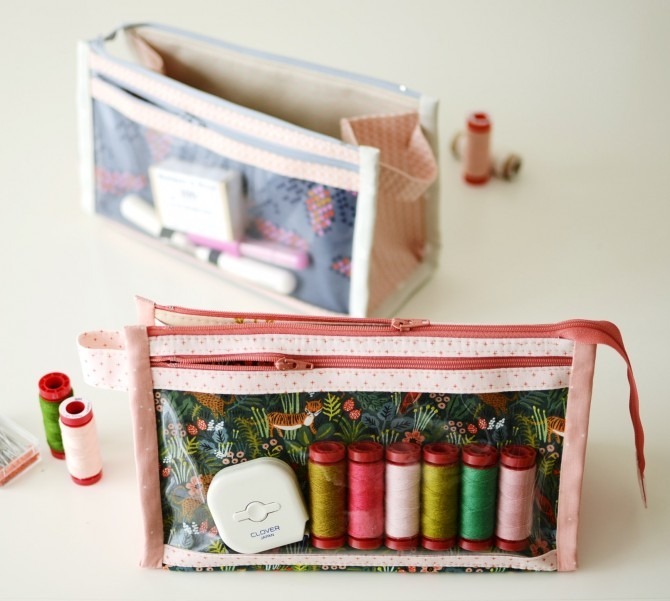 If you have sewing before but just want to sew with company and someone to help with the tricky bits, then this is perfect for you. If you are a complete novice, we will cover how to read the pattern sleeve and pattern itself, as well as learning about material weave and how it impacts the garment construction and fit. 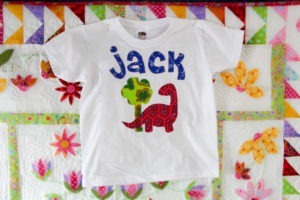 During the sessions we will cover cutting out the pattern, pinning, cutting and transferring markings. 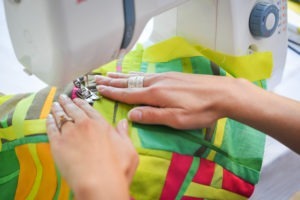 As you make up the garment we will learn about seam allowance, machine operation, and useful feet. Depending on the patterns you bring we can also talk through inserting zips, setting in sleeves, sewing dart etc. Finally, we will finish the garments with hems, and fastenings. This informative class will set you up for many hours of dressmaking! 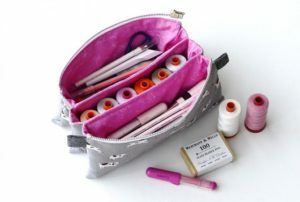 You will also receive my full teaching notes which will help you through many years of sewing.